I will be turning 30 in 130 days. I’m not ok with this for a few simple reasons…. 3. My 20’s were awesome and I’m not ready to give them up. Here’s my commentary on the 30 signs…. Happens all the time. In fact, I get depressed when they don’t card me. And their tip goes down….just a bit. 2. Instead of drunken party photos your Facebook friends all have baby photos. Just today, another precious cherub was born and announced on Facebook. And there is no way that 4 years ago I would have ever imagined that my roommate would be engaged with two children…before me! 4. You get super excited when you go to a concert and there are seats. I can’t even stand going to a bar now where there isn’t a seat available. I figure it’s part of getting old! 5. You start a story with “When I was in college” and realize that was 10 years ago. Oh my. The worst is seeing children I babysat graduating from college themselves. 6. When you watch teen movies/TV shows you find yourself siding more with the parents. That and good LORD aren’t they cheesy? They weren’t that cheesy when I was a kid. In fact, Full House was amazing and now I can’t stand to watch it or anything like it. 7. You’ve gone to a bar and left because it was too loud. 8. You have 10,000 business cards left from old jobs and no idea what to do with them. This one does not apply to me. Same job for 8 years now. 9. You’ve become a sunscreen nazi. This one also doesn’t apply to me…however I am certainly more cautious because the pain of being sunburnt is simply not worth it. 10. You find cool celebs who are in their early thirties and think there’s still hope. I rarely pay attention to celebs, unless of course Real Housewives are celebs? 11. You’re getting increasingly scared to check your credit score. 12. You’re seriously thinking about getting a dog…..no, a baby…..no, definitely a dog. We have talked about getting another dog. Then Shiloh totally screws that up by eating the recliner, or the trash, or the recliner and the trash. As for a baby, I’m totally ready. Just need something to get the ball rolling! 13. You’d rather pay a little more for a nice hotel room than cram into a hostel for you and a group of friends. True. And we’re all about saving money so we use points we’ve earned as much as possible. 14. Everything cool is being marketed to people younger than you now. I don’t even feel right wearing an UnderArmour sweatshirt for fear that I’m not cool enough for it. 15. You’ve definitely lost the enzyme that lets you digest Taco Bell. My metabolism and those enzymes are long gone. 16. There’s an increasing number of musical artists you haven’t even heard of. Every day I’m amazed with things on the radio. Or things my students teach me about pop culture. 17. Every night you find yourself not wanting to do things. I get exhausted thinking about a week full of things to do each night. It’s in my best interest to have at least one weeknight at home for many purposes. 18. You’ve experienced the dreaded TWO day hangover. And I still haven’t learned from it. 19. You realize your parents were your age when they had you and start cutting them some slack. I am a little nicer to my dad. 20. Running hurts your knees. The elliptical hurts your knees. Everything huts. Running is the quickest way to lose weight for me. However, it’s the most painful thing in the world. Go figure. 21. Teen slang makes you angry. Extremely annoying. People deleting on facebook. 22. You start buying shoes based on comfort. Heels…out of the question. Those are only for weddings and funerals. They are not for work. 23. An 11 year old has to show you how to do something on your smart phone. 24. Weekend nights: instead of having two drinks at four different bars….you have two drinks at one bar and then head home. Or no bar at all..
25. You voluntarily buy the fiber cereal. Fiber is important. Every day. 26. You get really excited about lame stuff….like low interest rates. It’s disgusting…and sad. But it’s true. We chose our carpet and our wood floors totally based on all the above. 27. You wonder, seriously, how you ever pulled an all nighter. And I can’t even remember when I did! Not sure about musical festivals….but I’ve certainly uttered the phrase, “I’m too old” many times. 29. You’ve graduated from IKEA to West Elm….or at least you want to. Sadly, I’ve never even been to IKEA. So West Elm….well that is out of the question. 30. You have been to a party where at least two of your friends brought their babies. All the time. However, I love babies and enjoy squeezing on them as much as I can. We are definitely in the phase of weddings and baby showers of our life. They are happening all the time. New babies, new marriages, change, change, change. And right now I struggle with being happy for everyone going through the change when it hasn’t happened to me. I’ve always been one who needs to work on patience. 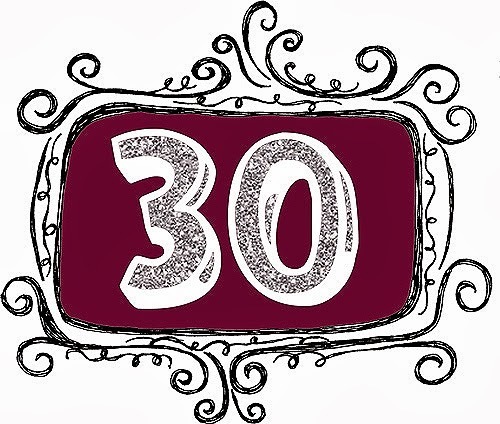 For now, I’ll focus on how awesome my 20’s were….and how much better my 30’s will be!